The school is private, charging a small monthly fee to all families who are able to pay such charges. If families are unable to pay the full fee, they give whatever they can afford; all families pay something. Not all pupils are halachically Jewish, but all are Jewish according to the Israeli Law of Return. In addition to day students, the school hosts nine boarding pupils up to the age of 13 in purpose-built premises. Youngsters reside in two- or three-bed rooms, each with its own bathroom. 53. Rabbi Liron Edri, a Chabad rabbi from Israel, arrived in the city in late summer of 2001 and has proved to be a strong leader for a Jewish population that had little effective indigenous leadership at the time. He has been adept in working with local officials in obtaining suitable property for a Jewish day school and additional land for a new synagogue. (See below.) 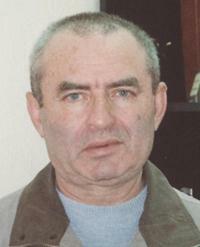 Rabbi Shmuel Kaminezki assisted him in making contact with several individuals with Krivoi Rog roots who have provided financial support for these undertakings. 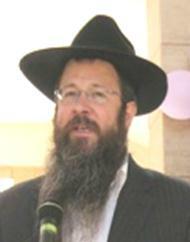 Rabbi Liron Edri, an Israeli, is an effective community rabbi in Krivoi Rog. &catid=79&id=1739. Retrieved July 21, 2011. 54. A new synagogue was completed in 2010, funded by a former Krivoi Rog resident. It seats 180 individuals on the main floor, with a portable mechitsa (barrier separating men and women) used during the week. An upstairs women’s gallery accommodating 70 people is used on Shabbat. 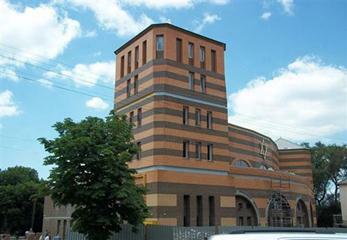 Unlike many other new or renovated synagogues in the post-Soviet states, the Krivoi Rog synagogue contains an elevator, which can be programmed for Shabbat. Surrounding the prayer hall are a number of classrooms and meeting rooms that accommodate a youth club, STARS classes for 45-50 students, a computer facility that offers computer instruction, a women’s club, a synagogue welfare office, a kosher food and Judaica store, a kitchen and dining facility, and offices. A synagogue welfare program distributes food parcels (provided through the International Fellowship of Christians and Jews), clothing, and some cash subsidies to needy individuals. A Jewish war veterans group also meets at the synagogue. A small, but well-designed local Jewish history museum occupies a room on the second floor. The synagogue also displays the work of contemporary local Jewish artists, some of whom have been able to attract purchasers through this exposure. The interior of the prayer hall is faced with Jerusalem stone. 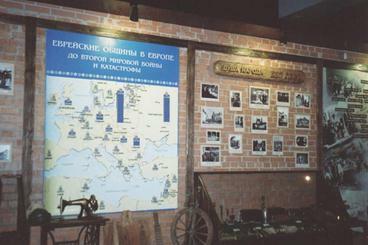 The Jewish history museum (below) contains detailed wall displays as well as historic artifacts. The map shows Jewish Communities in Europe before World War II and the Holocaust. The photographs are of prewar Jewish life under the caption Spirit of a People. Professionals working in the museum continue to do research on the Holocaust in the area. 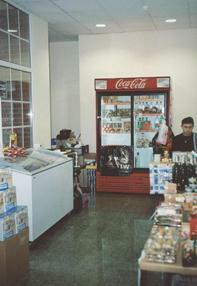 The synagogue kosher store (right) was well-stocked for Pesach and also carried Judaica merchandise. 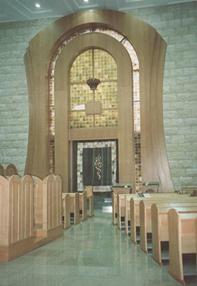 All photos of the synagogue interior were taken by the writer. A community mikveh with its own entrance is built into the lower level of Rabbi Edri’s home. His home also includes several suites for use by people who wish to be within walking distance of the synagogue. Three other Chabad families now live in Krivoi Rog, working in various aspects of Jewish communal life. One of the rabbis, said Rabbi Edri, is an Israeli; a second is from Dnipropetrovsk and studied for the rabbinate in England and Toronto; and the third, from Kharkiv, studied in Israel and New York. 55. The American Jewish Joint Distribution Committee and World Jewish Relief opened a new Jewish community center/hesed in Krivoi Rog in 2009. Known as Beit Graham, in honor of the Graham family of Great Britain who contributed a sizeable gift to renovate an existing building, the structure is a former two-story preschool. The restoration included installation of an elevator. Beit Graham premises now include a spacious library also used as an adult day center, a multi-purpose room with a stage, two dance studios (with full-length mirrors and ballet hand railings), a small sports hall, activity rooms for small children, other program rooms, and various offices. Director Vyecheslav Botvinnik spoke with special pride of lavatories that were modern, handicapped-accessible, and exceptionally clean. The hesed, said Mr. Botvinnik, actually has been operating since 1997. It currently serves 1700 clients including 70-80 homebound individuals who receive various types of patronage assistance in their homes. More mobile clients, he continued receive discount cards that can be used in three different supermarkets. Additionally, 144 Jewish elderly divided into six groups of 24 are transported to Beit Graham by bus, two groups at a time on a rotating basis, for a day center program that includes a hot meal, health screening, and various social services and activities. People are assigned to day center groups according to the area of the city in which they live; the city is too long for a single bus to go from one district to another, picking up or discharging people along the way. However, a separate group of 15 handicapped individuals from several different districts has its own day center program one day every week. Despite his stern countenance, Vyecheslav Botvinnik, is a pleasant man with a sense of humor. Upon introducing himself and before the writer could even respond, Mr. Botvinnik stated that he is not related in any way to Mikhail Botvinnik (1911-1995), a world champion Soviet chess player.